Ross County chairman Roy MacGregor says Patrick Kluivert remains in contention to become the Staggies' new manager. The Dutchman emerged as a shock candidate to replace the sacked Derek Adams, but weekend reports suggested he had ruled himself out of the running. "I talked to his agent yesterday," MacGregor told BBC Scotland. "I think he's interested in a number of jobs but [his agent] alleged he's still interested in the Ross County job, so we'll take it from there." 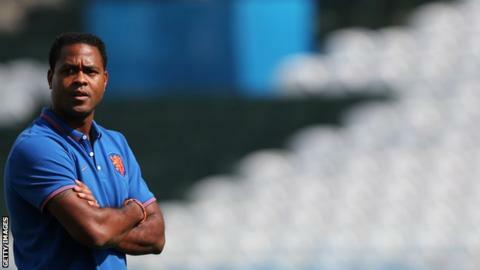 Kluivert, who earned 79 caps for the Netherlands, was assistant manager to Louis van Gaal at the 2014 World Cup in Brazil, helping guide Holland to a third-place finish. The 38-year-old has not managed a side on his own, however. "We all remember Kluivert as a player but not as a coach," MacGregor added. "We need to make sure whatever we get, it's suitable for Ross County. It's not about names and it's not about personalities." The County chief revealed the club have received more than 80 applications for the job, and he ensured fans that a huge amount of thought will go into the appointment. "There are a lot of managers and coaches out of work, so I'm not sure if the number is significant, but it's the quality of people that's amazed me," MacGregor said. "Over the next 24 hours I will sit down with my board and look at the job description of what Ross County requires for the next three-to-five years, we'll have a look at the CVs and try to draw up a shortlist. "I need to get the job description fixed with my directors and make sure we understand completely, because you can get the best manager, but if that's not aligned to what the club's objectives are it will fail. "The onus here is on myself and the directors to understand what we require in the three-to-five year term, allied to the fact we have a football academy here and allied to the fact we have no points on the board, so we need some impetus right away." MacGregor refused to put a timescale on any appointment, with County not in action until a week on Saturday due to the international break.